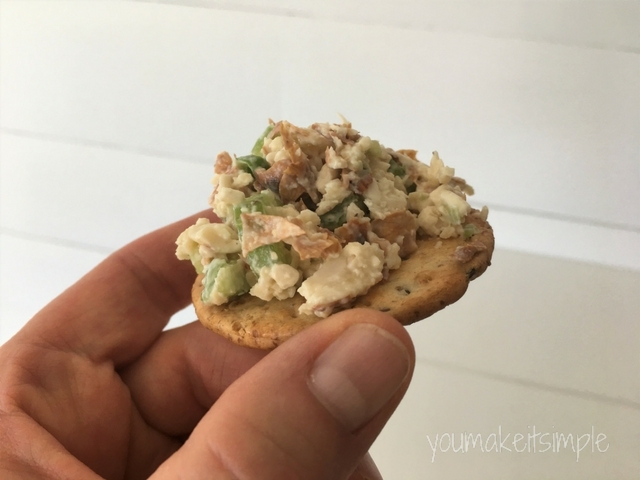 This raw almond mock tuna salad is a great option for a plant based meal. 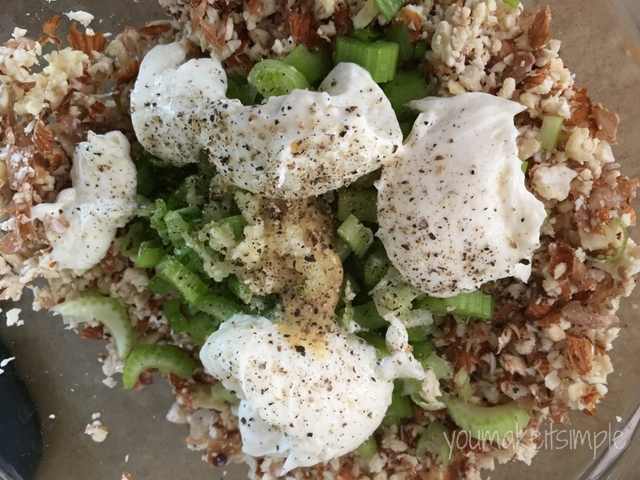 Make yourself a protein packed “tunaless” tasty sandwich, wrap, or snack. Eat it alone on a bed of lettuce, on top of a cracker, or on a thick slice of crispy cucumber. Any way you eat it, you won’t be disappointed. 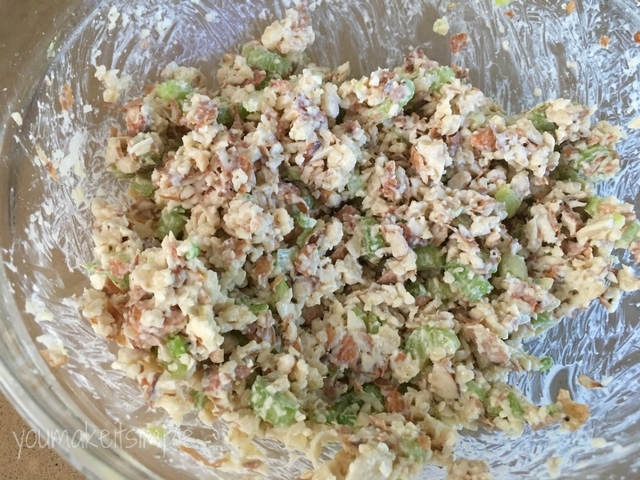 The finely chopped soaked almonds gives a nice texture, (just like a tuna salad) and are packed with nutrition. 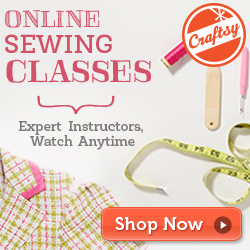 What is the purpose of soaking almonds and seeds before eating? 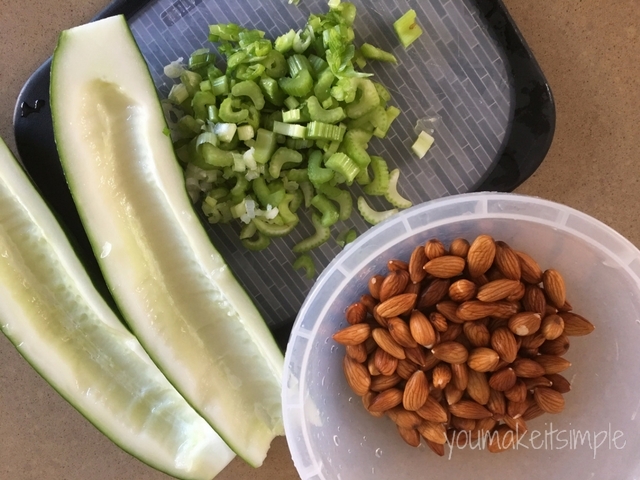 In addition to changing the texture of the almonds, soaking helps make them more digestible. Softer almonds are easier to digest, which increases the amount of nutrients your body can absorb from the nut. If you want to amp up the nutritional value of raw nuts and seeds, sprout them. Robyn Openshaw, one of my most favorite mentors on food and nutrition has a great video that explains the why and how to sprout almonds. You will LOVE her. I have been following her for many, many years. Back to the mock tuna recipe. Once the almonds are soaked, it will only take you about 10 minutes to whip this up. I love my Blendtec!!!!! 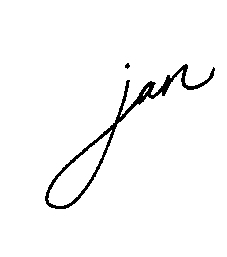 I use it pretty much every day, or several times a day. This link is a great option for a refurbished version, or Costco is selling them now for around $229. This is awesome, because over ten years ago, when I bought mine, I paid around $400 and it was well worth it!!!!! Could not live without it Just in case you are thinking about getting a blender, don’t waste your money on anything else but a Blendtec or Vitamix. 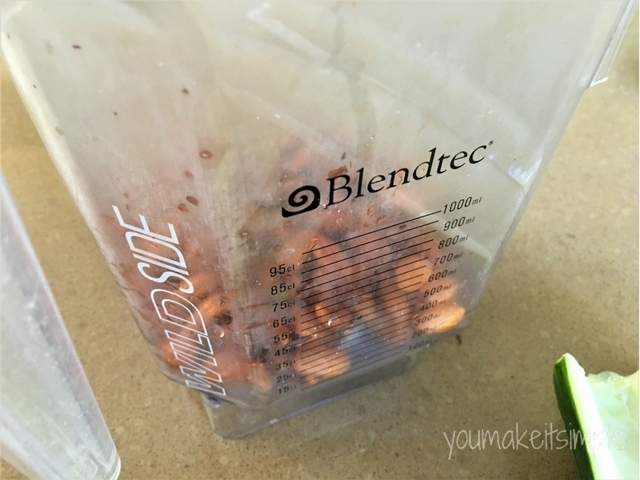 1- Soak almonds and sunflower seeds for 3 – 8 hours in water. 2- Drain and rinse 3- Place almonds in a food processor or high speed blender. 4- Pulse until it is the consistency of flaked tuna. 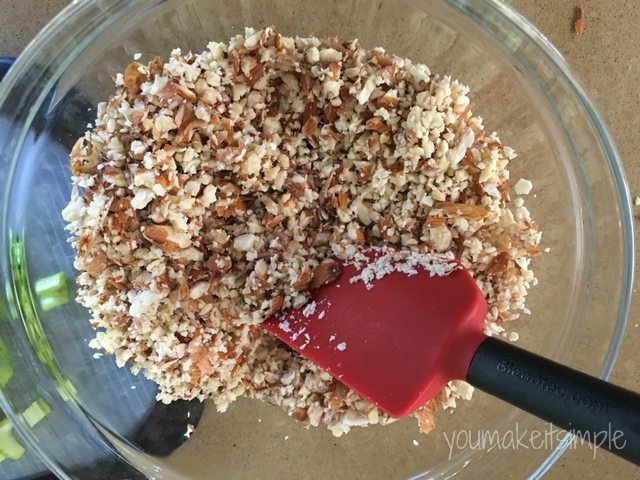 5- Place chopped almonds into a mixing bowl and add the rest of the ingredients. 6- Stir to combine and season with salt and pepper to taste. 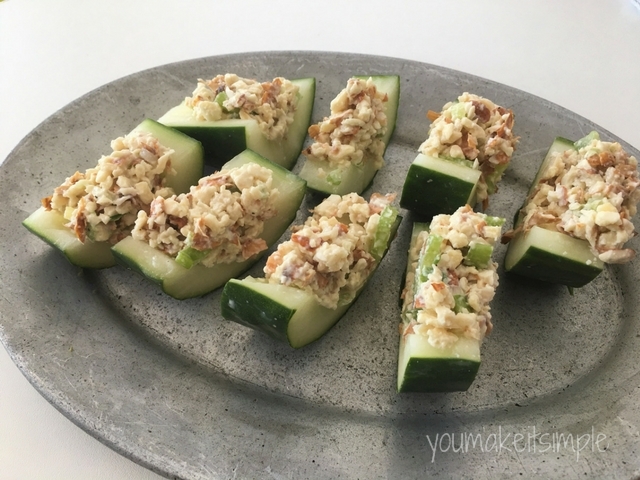 Serve on crackers, cucumbers, bread, in a wrap or a bed of lettuce. 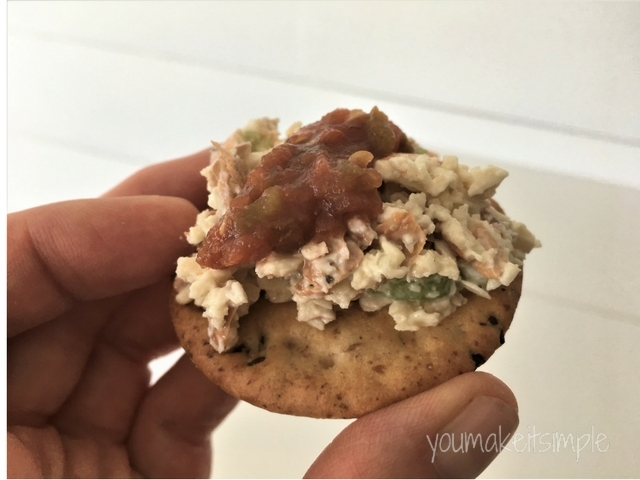 My husband put a dollop of salad on a cracker and then added a spoonful of salsa on top. It ended up being quite yummy. You’ll have to give it a whirl. 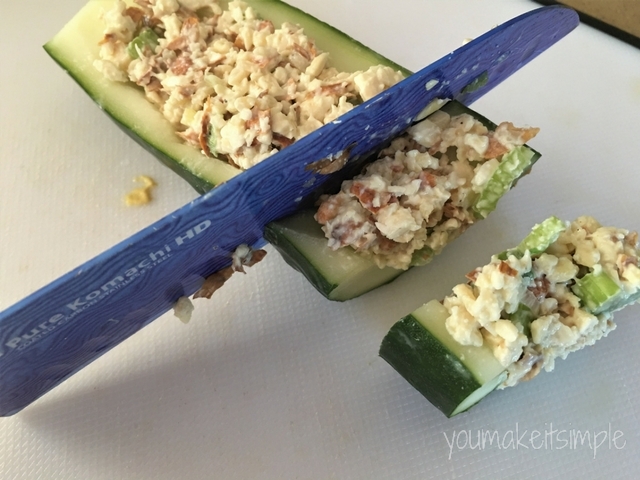 To make stuffed cucumber horderves, simply cut a cucumber in half lengthwise and scoop out the seeds.